In the previous post covering Manufacturing & Services PMIs for BRIC economies, I promised to provide a separate summary of composite PMI-signalled activity. Brazil composite activity stood at 86.4 in June, down from 88.4 in May. 2Q 2015 average was 88.5 against 98.4 for 1Q 2015 and down from 99.7 for 2Q 2014. In short - we have ongoing and worsening slowdown in activity across both sectors combined, with the fourth consecutive month of the combined reading below expansion line (100). Russia composite activity stood at 98.2 in June, down from 100.4 in May. 2Q 2015 average was 99.4 - an improvement on 92.2 for 1Q 2015 and better than 96.4 recorded for 2Q 2014. The ongoing slowdown is moderating, with activity across both sectors combined showing slower rates of contraction in 2Q 2015. That said, combined activity has been posting contractionary signals in 8 out the last 9 months. India composite activity fell to 99.0 in June, posting the first month of sub-100 reading since April 2014, down from 102.2 in May. 2Q 2015 average was 101.6 against 105.4 for 1Q 2015 and down from 102.4 for 2Q 2014. This implies that Indian economic activity growth was posting a significant slowdown q/q and y/y in 2Q 2015. China composite activity stood at 101.2 in June, down from 102.7 in May. 2Q 2015 average was 101.9 virtually unchanged against 102.0 for 1Q 2015 and up slightly on 101.1 for 2Q 2014. China's economy was the only economy in the BRIC group that remained above the 100 line in June. 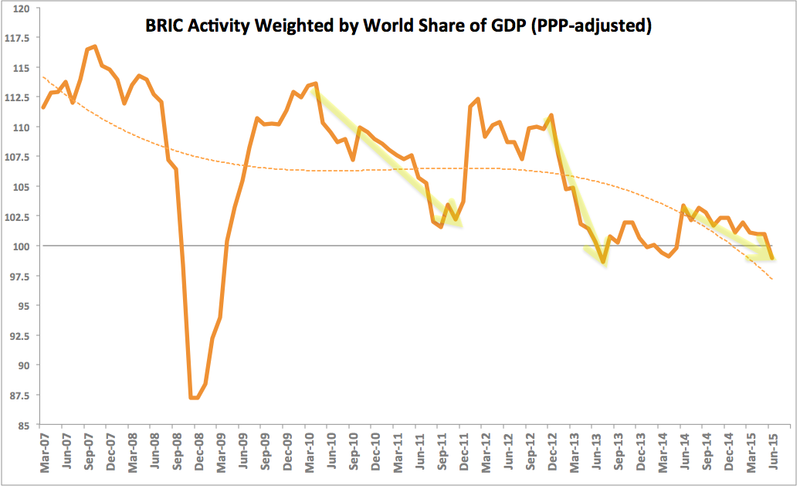 In summary, things are getting worse, progressively across the BRIC economies, with Russia, surprisingly, presenting an upside momentum to the overall group growth dynamics. 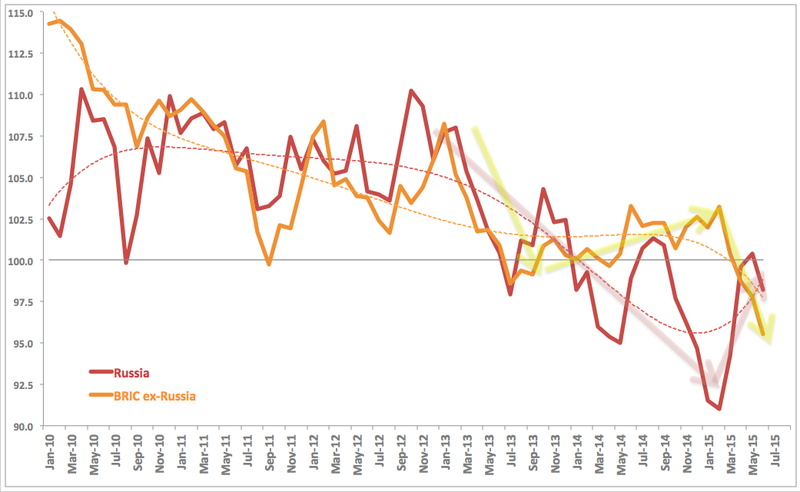 That said, the trends are yet to be fully established for Russia. 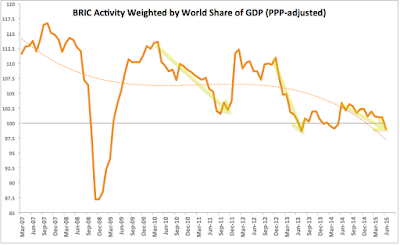 Overall, BRICs have now running along the negative growth trend for some time and BRIC combined (weighted by each economy share of total group GDP) momentum is at 99.0 in June, marking the first sub-100 reading since May 2014. 3mo average through 2Q 2015 is at 100.3, down on 1Q 2015 average of 101.4 and down on 2Q 2014 average of 100.8.